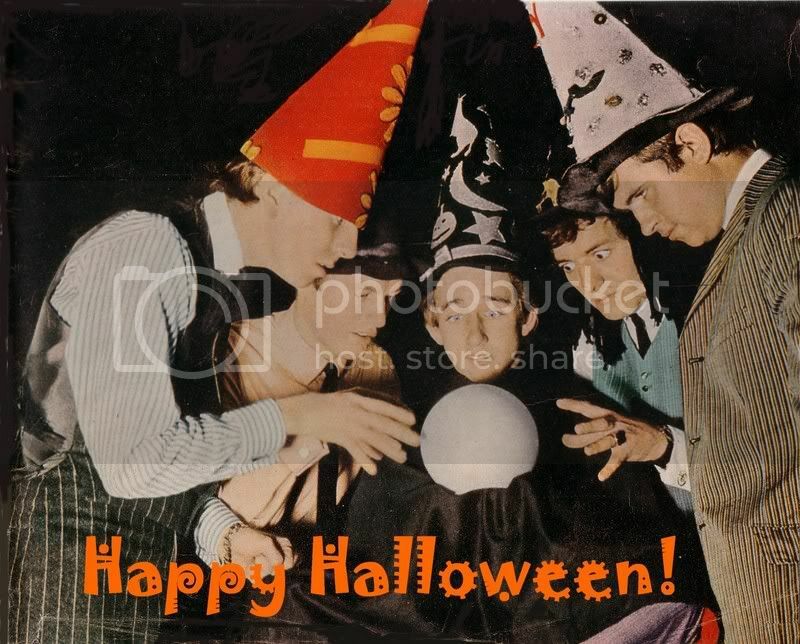 The Hollies :: View topic - Happy Halloween! The Hollies Forum Index » My Back Pages » Happy Halloween! Hee!Hee!This is spot on .I love it!!!!!!!!!!!! !I definitely think Allan has the power of hypnosis,look at those eyes .I'm sinking fast!God I hope the trick or treaters at my door tonight look like these guys.I can think of a few tricks I'd like them to perform .Happy Holliewe'en Vrinda.You are a "Smashing pumpkin" . Thanks, Paula and Anthony! I do hope I get some trick-or-treaters who look like this! They'll get a few tricks and treats me from as well! No doubt that Allan is a Svengali. Even when he sings, his voice has a very hypnotic effect on people! If you look closely, you'll see that he's wearing a black witch's wig! You can see the long, stringy hair falling about the sides of his face! Talk about funny! Maybe they're gazing into that crystal ball, and seeing their own future unfold - the #1 hit "I'm Alive" in 1965; Allan's son being born in 1966; Eric leaving and Bernie entering; Tony growing taller; Bobby buying more hats; Butterfly and Evolution; Graham leaving and Allan crying buckets of tears; Allan's mustache, perm, and earring; the 1983 reunion; the fact that 40 years later, they'd still have so many loyal fans and that women would still swoon over them ... now I'm going to stop. Again, thanks for the compliments, everyone. They mean a lot! Wow, Vrinda! What a great "treat" on Hallo(Hollie)ween! Thanks! Never noticed Allan's wig,Hee!Hee!I love it .What a future the boys had ahead of them.But did they ever think that more than 40 yrs on so many women would still be having palpitations at the sight of them ? Thanks, snowflake! Paula, I think the guys had no clue that forty years later, their very images would cause so many women to go into the same frenzy they had at their concerts, or even that some new-fangled invention called the Internet would exist so that these very photos could be posted for people all over the world to see! Thanks, snowflake! Paula, I think the guys had no clue that forty years later, their very images would cause so many women to go into the same frenzy they had at their concerts, or even that some new-fangled invention called the Internet would exist so that these very photos could posted for people all over the world to see! I NEVER thought I'd say this but ,God bless the internet ,for letting me see pics like this and for "meeting"such lovely Hollies fans.